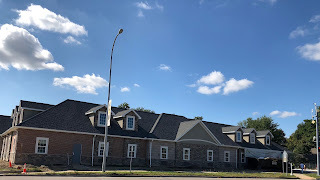 Meadows Assisted Living and Care Campus began the construction process in September 2017. Land was graded, foundation was poured, and framing took off; Soon after, Meadows was a complete building! Meadows is excited to announce the project is headed towards completion and scheduled to open Fall 2018. The 25,000 square-foot building features 30 brand new private suites with personal baths (4 semi-private), high ceiling living area and cozy bricked fireplace overlooking living area. Luxury dining with customized meal preparations. The Meadows Promise is to provide a comprehensive healthcare delivery system that combines residential care with a special focus on restoration for those with special, traumatic conditions. Meadows is now pre-booking suites. Contact Meadows today for a tour at 586-461-2882 or email info@meadowslifemi.com. Conveniently located at 71 North Avenue in Mount Clemens, Michigan.